Nine out of the 10 accused were arrested on January 8, after being found in possession of nearly a kilogram of methamphetamine powder that was intended for sale around Phnom Penh. Their ringleader, Obieze Kennth Uche, also known as John remains at large. 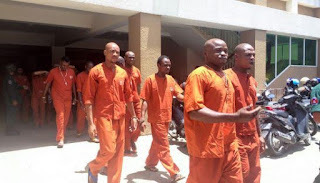 The convicts include, Tony Chukwuonye, two brothers, Okorom Favour and Okorom Kizito Chinedu, Francis Nnamdi, Simon Maduka Ukandu, SundayNwabuisi, Nna Mezie Victor, Izuchukwu Chukwuma. "The court is ordering the arrest of Obieze Kenneth Uche," Judge Khy Chai said. 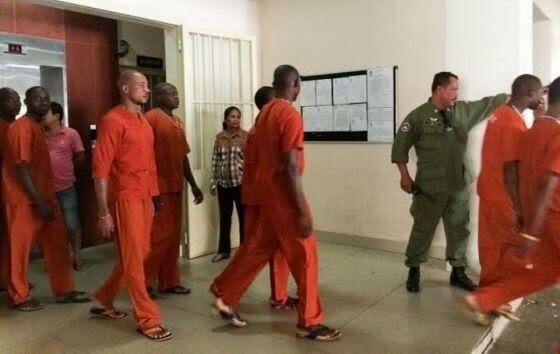 "After the verdict comes into effect, all nine foreigners, after serving their jail terms, have to be deported out of Cambodia and prevented from entering Cambodia for the next five years." On the last day of the trial, it was revealed that only two out of the 15 samples collected tested positive for meth, with 4 and 5 percent purity, respectively. Greetings to the general public, i want to inform you about what i can do to assist you in getting a real good sugar mummy in Nigeria. Note: If you really want a sugar mummy and you also believe that you can handle it very well kindly call me on 08169207857.There are so many Nigeria women who are desperate in getting a guy that we satisfy them. contact me today on my mobile phone number via 08169207857 for more information s thanks..
Every action has a consequence - it is no ones wish to celebrate their many years life spending in prison but we all have to uphold the rule of law as the law is what has the mandate to govern us.